I was familiar with Fly Kouzina but never got an opportunity to visit this unique aircraft themed place. So last week when I received an invitation from Thinkquisitive at the Bloggers Meet arranged by Dineout and Fly Kouzina in association with Thinkquisitive I was really elated and excited to be a part of this event. If you are not familiar with Fly Kouzina, then I must start by saying that it is truly an amazing place (that you can well check out from my pictures of this place) that will entice you with its ambiance and satisfy you with its food and mocktails. 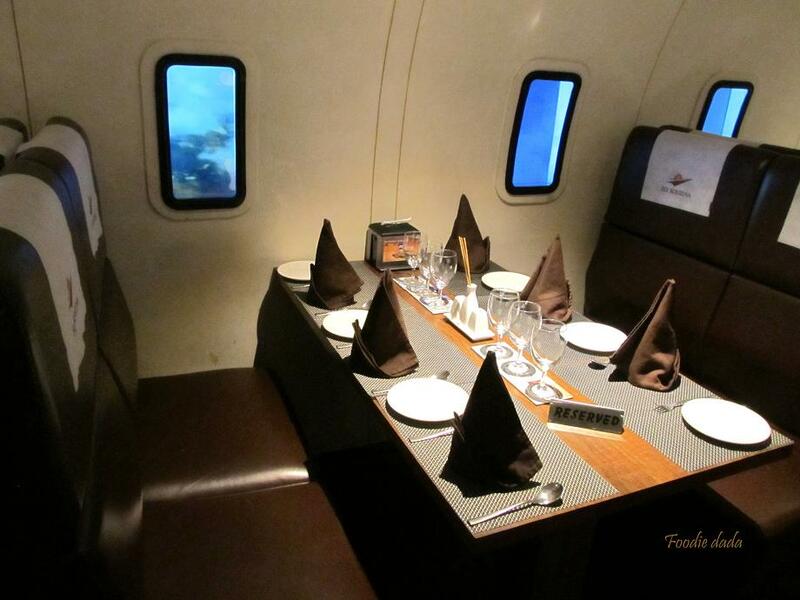 It is Kolkata’s first aircraft themed, pure vegetarian multi-cuisine restaurant. 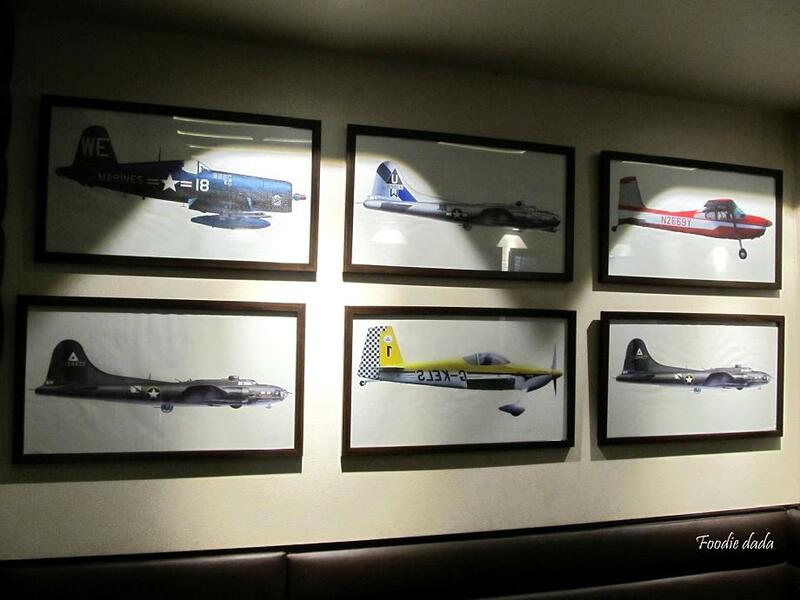 As you walk inside the restaurant you will find a classy and spacious aircraft themed eating joint with amazing airplane models hanging from the ceiling or nicely framed fighter plane pictures on the walls, but that’s really nothing! This outer section is somewhat like a lobby at the airport maybe. You are yet to feel the real Fly Kouzina thrill, since till now you haven’t yet boarded the flight, the exquisite gourmet flight! So, now if you step inside the aircraft section, you will actually feel like you have stepped inside an airplane. Though you won’t find the overhead lockers but that doesn’t make much difference since you can see the exact sight from your seat like you see if you are inside an aircraft. So as expected this section is a long I- shaped area like it’s there inside an aircraft, you have seating arrangements of two sides of an alley (with wooden flooring) The seats are grouped into four forming some sort of a cabin, so if you are a group of four of less it’s better to sit in this unique aircraft themed section. The seats are perfect and look like the aircraft seats with proper height and feel. Now you have the small aircraft windows beside your seats precisely as you get in reality with the scenes of clouds floating by while you devour your favorite delicacy! Even you have the emergency exit at one of the seats with was really interesting to spot since I was actually looking for it 🙂 The interior of this section and the lighting is absolutely fabulous, nothing less than that. 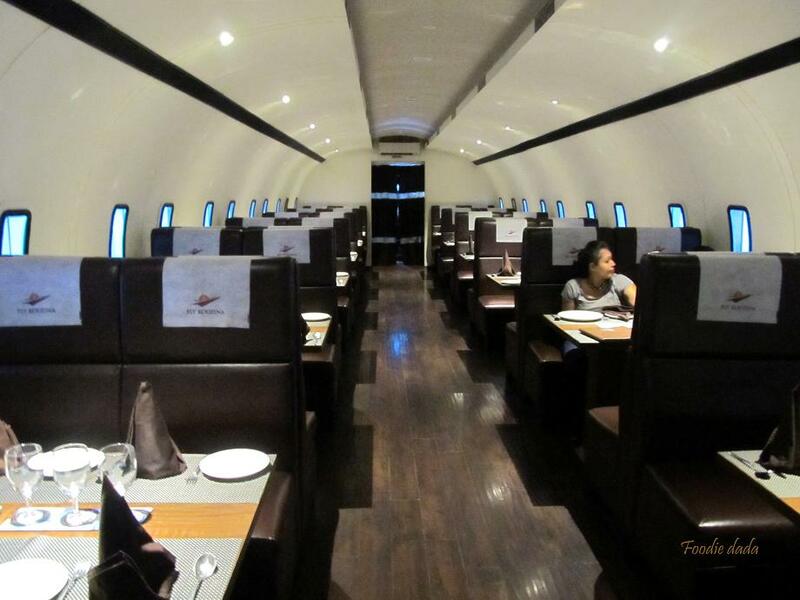 So you can have a turbulence-free comfortable eating expedition sitting inside an aircraft, which seems to have landed right here at Kolkata 🙂 In the outer lobby section you get some really comfortable couches, with wall clocks showing world times and some amazing background music. You have a bar counter at the farthest distance from the entrance which is nicely decked up and has a revolving sparking ball on top and a huge LED TV on the wall, but sadly the place is yet to get its bar license. Since I am talking about the ambiance and feel I would also like to mention the way the staffs are dressed, they perfectly look like the crew members you will find inside an aircraft, that’s another obvious point which has been kept in mind and executed perfectly. And yes, the person at the gate won’t scan you or check out your baggage tags like they do at the airports, so chill and enjoy your meal 🙂 But not to forget the amazing Boarding passes which we were handed over with our Blog names printed on it! Looked so real and that gesture was pretty impressive! 1) Manchow soup – We started off with this pretty common steamy bowl of oriental soup with crispy noodles by the side, the soup is a combination of fermented soya and chilli that tastes good if not great. The seasoning of chopped cilantro and veggies in there made it quite filling. The consitency was not too thick and the spice level was just optimally correct. 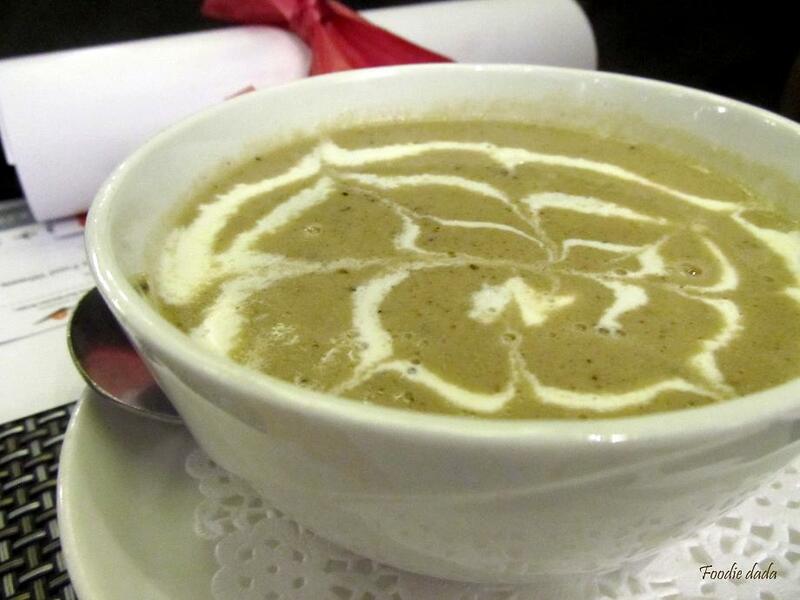 2) Cream of mushroom soup – To start with, this bowl of soup looked gorgeous, with the cream on top it would have looked even better had it been served in a black colored soup bowl. The cream of mushroom soup had some amazing subtle flavors and should have been tried or served before the manchow soup. The thick soup with the mushroom pieces in the bottom was a treat to have. 3) Crispy chilly baby corn – One of the most common dishes you will get in an eatery these days, and if you are vegetarian you are almost bound to order one plate of this every time you go out for a meal. The taste here was good like it should be with a nice crunch to it. The dish had sesame seeds sprinkled on top and tossed well with bell peppers. Pesto marinated cottage cheese skewers with bell peppers, pineapples and onions grilled to perfection. The cottage cheese or paneer cubes were fresh and soft. This one is surely worth a try. 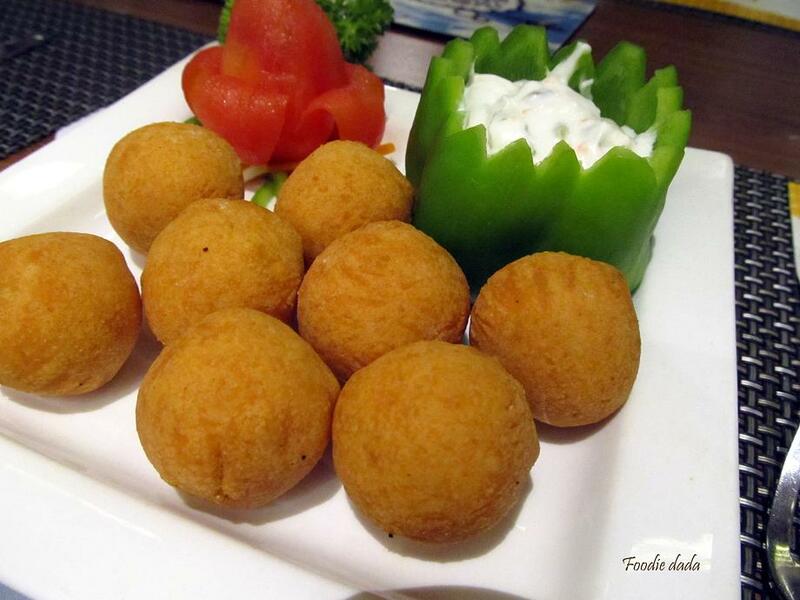 5) Cheese balls – Oh I loved these cheese balls, we were served eight cheese balls in a plate with a artsy green bell pepper carrying the mayonnaise dip. The presentation all though out was pretty impressive. 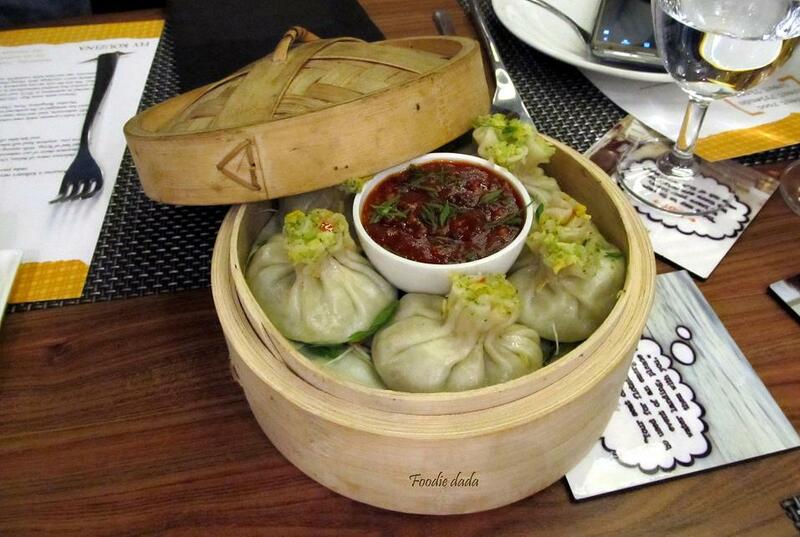 6) Broccoli corn dumpling – I tried three pieces of these dumplings and I was longing for more. I rarely go for veg dumplings at places where you get chicken or pork dumplings, but as a matter of fact I am madly in love with dumplings in general so the filling inside can safely vary. Here I was overwhelmed by the bamboo box presentation and by the size of the steamed dumplings, mighty impressive. The looks were not at all deceiving since the first bite assured that I will go on to try more of this. The super minced broccoli and corn fillings was juicy, tasty and teamed up well with the silky soft outer cover. Dip it into some red medium-spicy momo sauce that was provided. Must try! 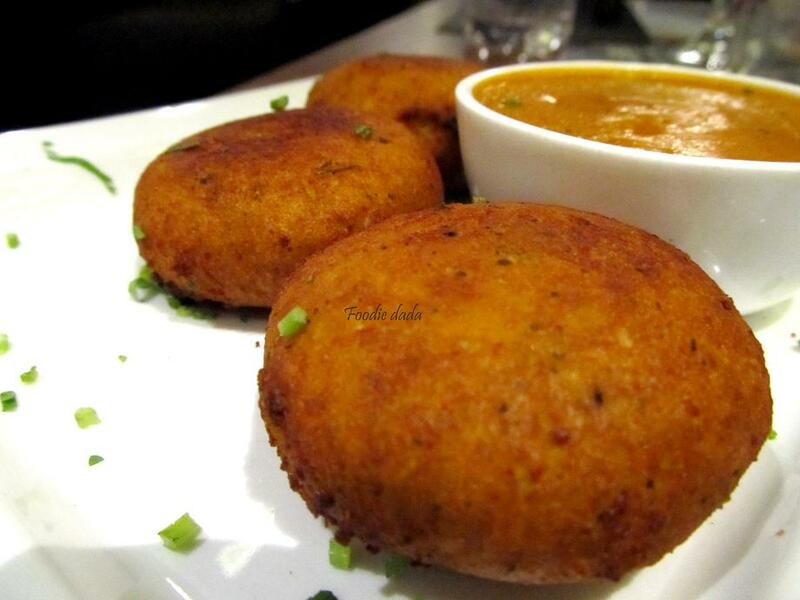 7) Malai paneer tikki – These were really some melt in your mouth stuff, oozing with flavors. They are clay oven toasted Paneer tikka with cream, the tikkis are stuffed inside with a smooth paste of cottage cheese with zero spiciness. Soft, somewhat gooey filling that goes well with the creamy orange dip which was provided. 8) Kadak subj seekh kebab –I didn’t like this starter much. A plate had six kebabs with thinly sliced cucumber shaped like noodles. The kababs which have minced vegetables in it (and cooked in tandoor) were too dry for my liking and did not have that kick or stuff in it to get you glued. 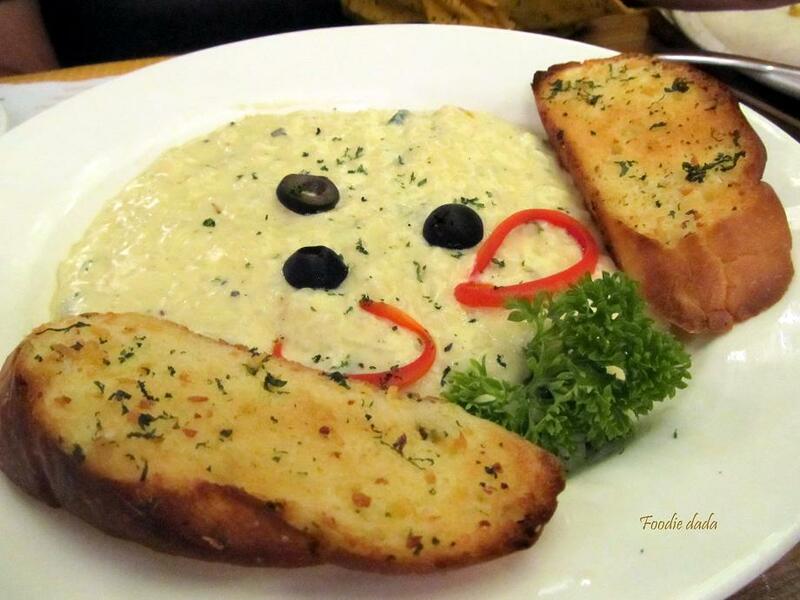 9) Cheese garlic bread – It had the subtle kick or garlicky flavors in it. It’s just herb and garlic toasted breads with cheese on top. The cheese was put just in right quantity and overall you can try this, nice one. 10) Virgin Colada – One of the best mocktais for sure that is available at this place. It is bit thick, white colored frothy drink with a mix of coconut, ice cream and pineapple juice. Very refreshing and needs to be consumed when chilled. Must try! 11) Strawberry Margarita – I didn’t quite like this though it looked very promising and the presentation was wonderful. 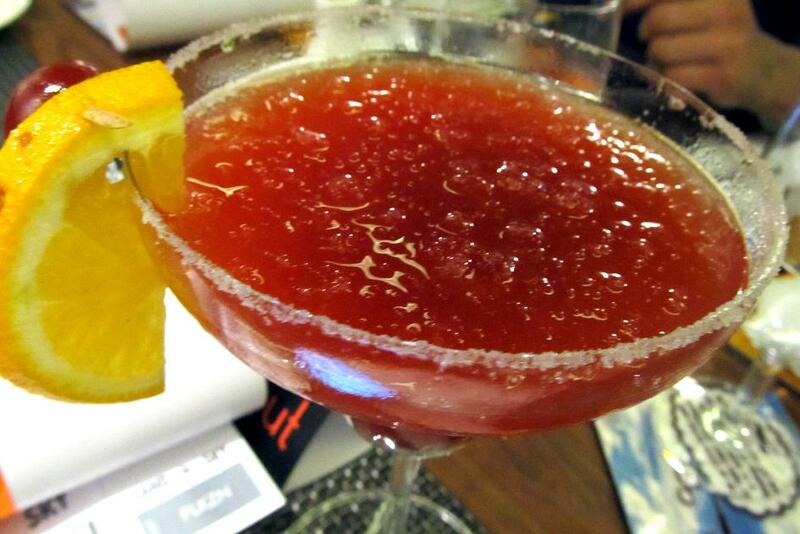 It has a blend of strawberries, orange and lemon juice with a pinch of tobacco and Worcestershire sauce. 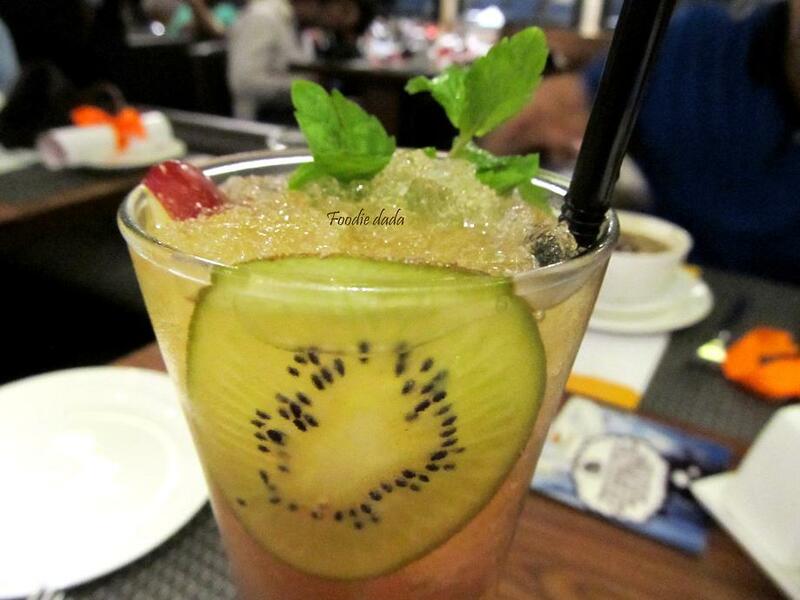 12) Virgin mojito – Classic cooler and refreshment option available at every restaurant these days. Here also it was nice and refreshing with a nice blend of fresh mint leaves, lemon and sugar. There is nothing to write home about but it’s nice as it should be. 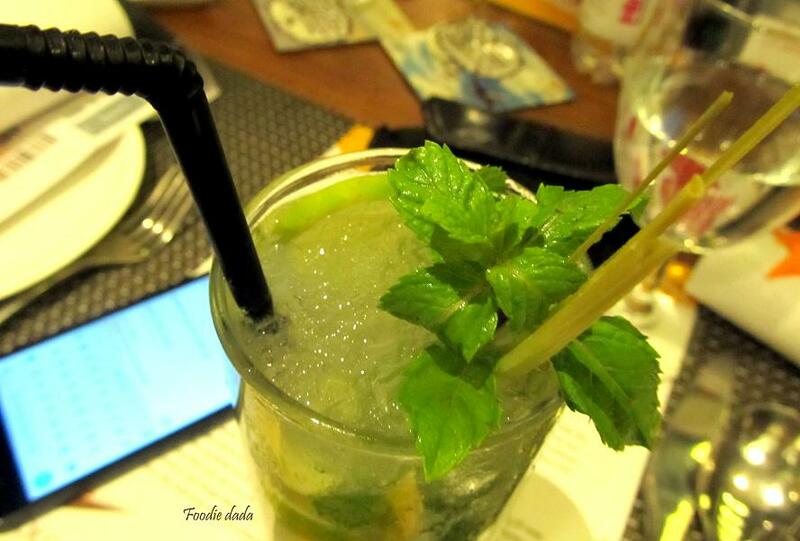 13) Lemongrass mojito – This was one of the best coolers of the evening. Very refreshing and had a nice tang to it that suited my palate. 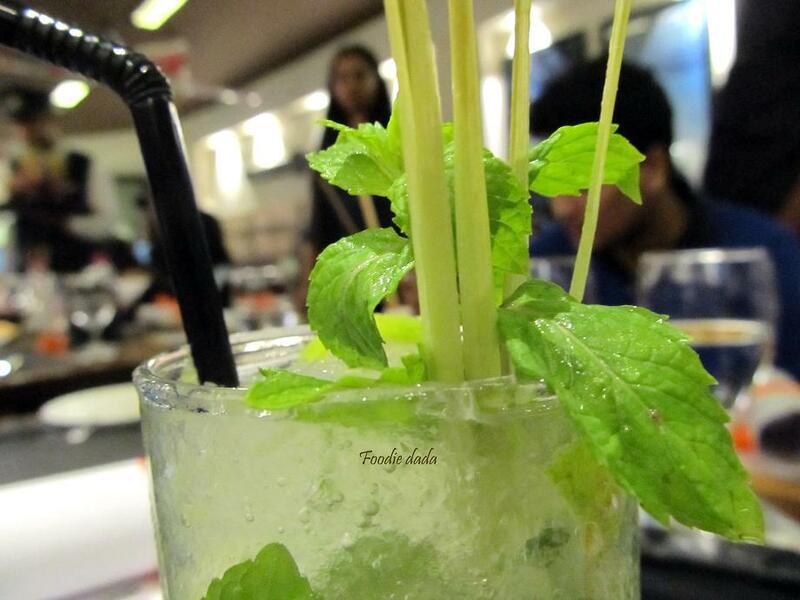 It had fresh mint leaves and lemon chunks muddled with lemongrass and mint mojito syrup, topped up with Sprite. The presentation was wonderful and the black straw in all the drinks looked more sturdy and classy. Must try! 14) Orange mojito – The orange mojito was nice but somehow I preferred the lemongrass mojito more to it. It was a blend of fresh mint leaves and orange muddled with some brown sugar. 15) Barman’s pitcher – Without a whiff of doubt, this looked amazing. It was served I a log glass. But taste-wise it had taken bit too much ingredients in it to taste like one single thing, as a result it got a muddled taste which surely needs to get back its unique character. It has a blend of apple juice, cranberry juice, peach syrup, grenadine syrup, and topped with loads of Red-bull. 16) Mint lemonade – It was nice and refreshing but tad too minty for my palate. It was relaxing though with a blend of lemon juice, mint leaves and crushed ice. 17) La Pizza Verde – From here we started off with the continental main course. It had loads of exotic veggies like zucchini, broccoli, sweet corn, etc and loaded with some great quality cheese. The crust was not too thick and not at all chewy. I would recommend this stuff. 18) Pizza Kouzina – This was the second variety of pizza for the day. It was the chef’s special pizza with the pesto dip. The pizza was again studded with exotic veggies and I could remember having baby corn, yellow and red bell peppers, etc as the toppings. A nice one and not at all spicy. 19) Risotto Alle Verde – The risotto was somewhat not having that zing which I was looking for. Maybe I was dreaming about some pieces of chicken in there which was missing since this is a vegetarian joint. It had Arborio rice cooked with loads of cheese and optimal quantity of corn and herbs sprinkled on top. The dish was supported by buttery garlic breads by the side which were nice and quite something not to be missed. 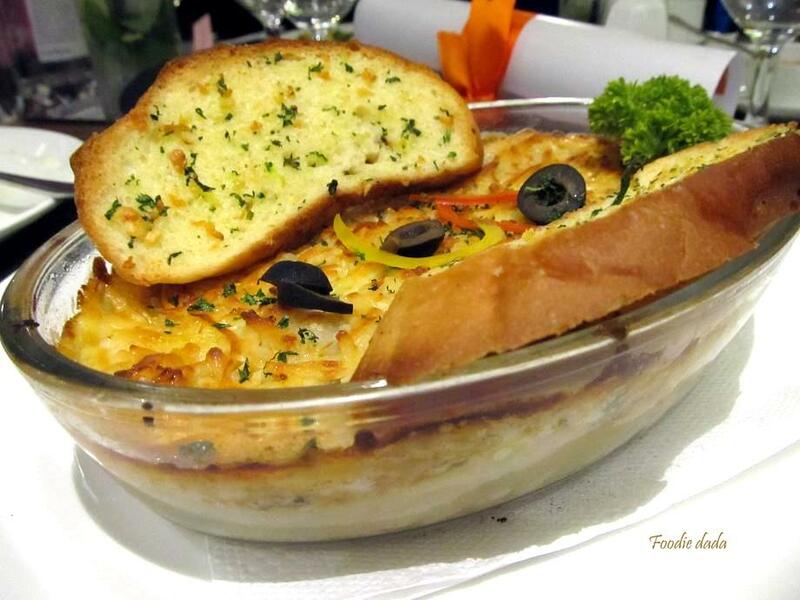 20) Lasagne De Verde – Oh I loved this lasagna and though I thought I will not find this interesting for the vegetarian finish, but then after the first tryst with vegetarian lasagna I found this to be equally attractive. It had layered pasta with an array of exotic vegetables. Must try! 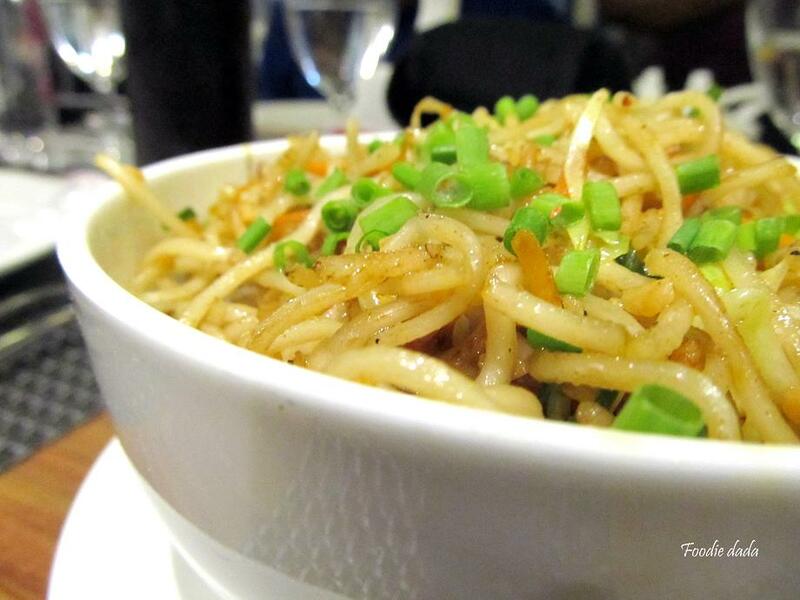 21) Chilly garlic noodles – One portion of this dish was enough to suffice the appetite for two. The simple garnish with chopped spring onion leaves was common yet somewhat appetizing, the noodles had enough veggies in it having the perfect crunch. It was a typical Kolkata style hakka noodles which is common in several eateries. The garlicky touch added some brownie points to it along with the mild spiciness from the dry red chilies. The flavor could have been tad better since it was somewhat marred by the excess oiliness in there. 22) Sweet & Sour cottage cheese – The side dish that was provided with the hakka noodles was sweet and sour cottage cheese. The preparation was quite simple with mild tangy gravy having bell peppers, tomato and pineapple cubes tossed along with some fresh paneer cubes. Nice one to go with the noodles. 23) Subz Dum Biryani with Raita – This biriyani was the star dish, for sure! I rarely try veg biriyani but this time I was floored by the sheer aroma and flavor of this show stopper dish! We were completely full when this was served and were reluctant to try it, but then when we tried a spoon we realized it’ll be a crime to miss this! 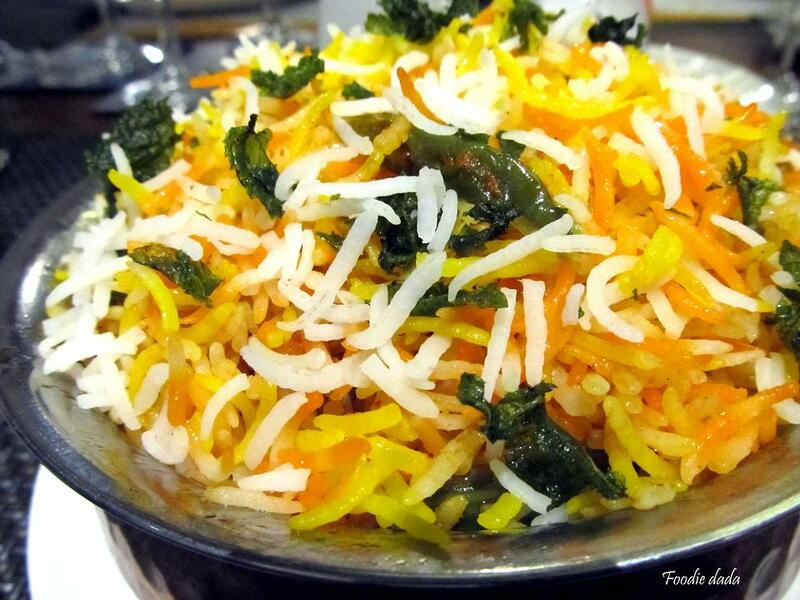 The biriyani looked great as the various shades of long flaky rice gave an amazing look to it. The aroma of ghee was mesmerizing and in the end I was shamelessly having it directly from the the handi 🙂 It was slowly cooked in dum pukht style with lovely basmati rice and generous quantity of vegetables. Must try! 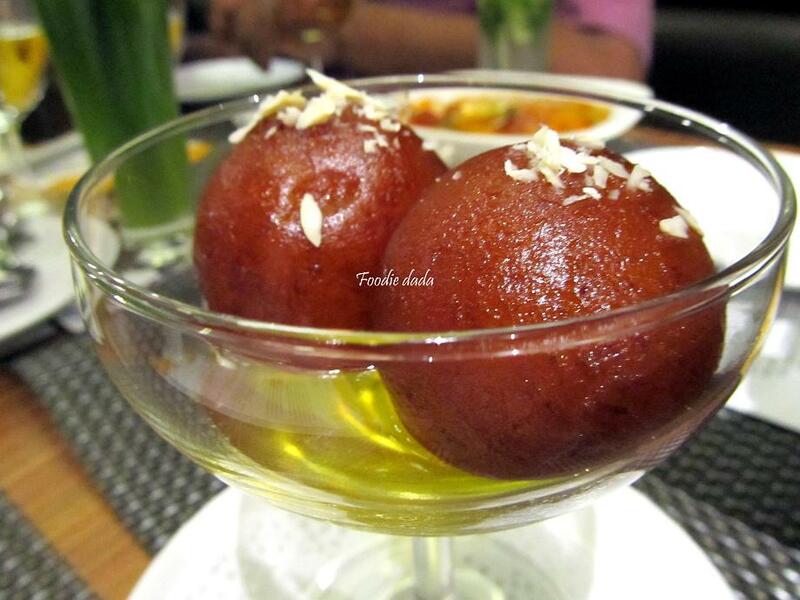 24) Gulab Jamun – Lovely warm and soft gulab jamuns to end the meal. It was drenched in the sweet saffron syrup which was deep in there the gulab jamuns. The entire stuff was melt-in-your-mouth types with nuts and resins and a soft core. 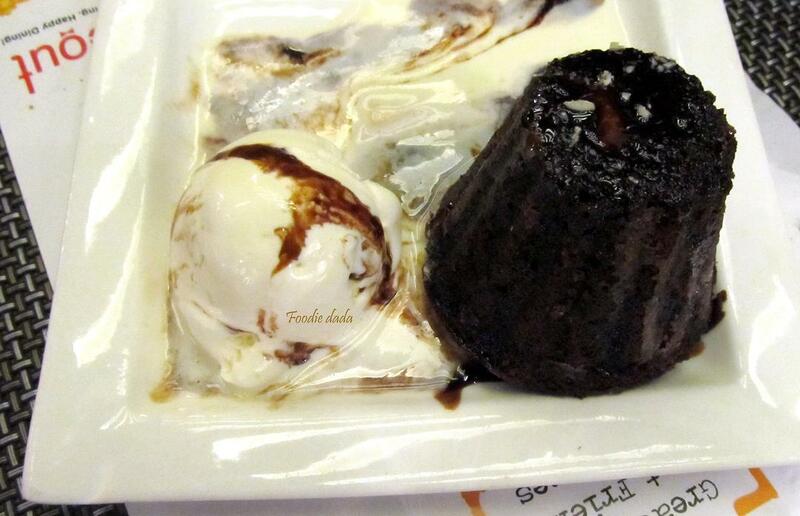 25) Sunken Chocolate Pudding with Vanilla ice cream – This was just the dish we were looking for to end our meal. It was yum, fudgy and delicious! This was hot chocolate soufflé with a dollop of vanilla ice cream. It was another melt-in-the-mouth dessert that impressed each and everyone. The cream patisserie was bouncy and smooth, and surely very well beaten. The ice cream was bit molten when served but otherwise it was perfect. Must try! There were many more items, especially in the Indian main course menu which we could not try since we were super stuffed! And infact, some of the mocktails were so good we tried couple of glasses of them leaving us more stuffed 🙂 Maybe serving so many items and to so many bloggers left the servers weary and in the end we could not taste the Indian main course items, not that we were not full when we reached that point of time! 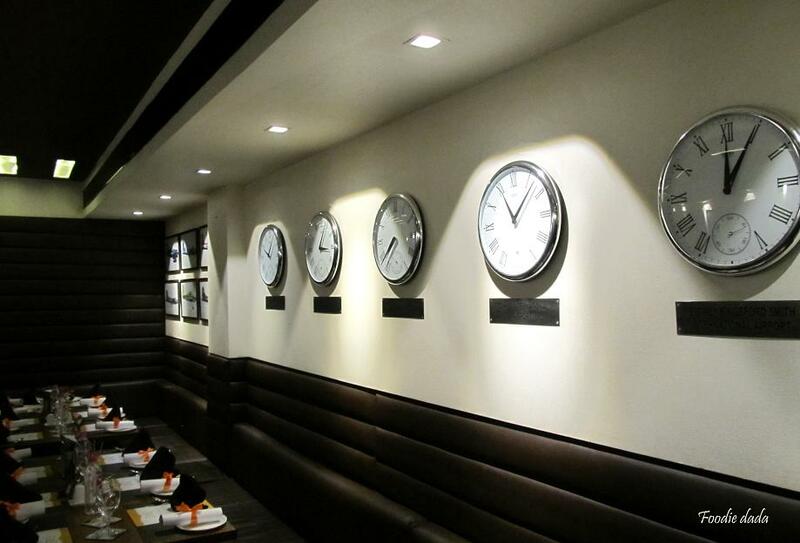 Otherwise the servers were very courteous, soft spoken and polite. And I would say they did their best to handle such a huge group of bloggers as well as general customers seated in the aircraft section. Overall I will give this place 80% positive feedback and it is a must-visit joint for all the vegetarians, no doubt about that. 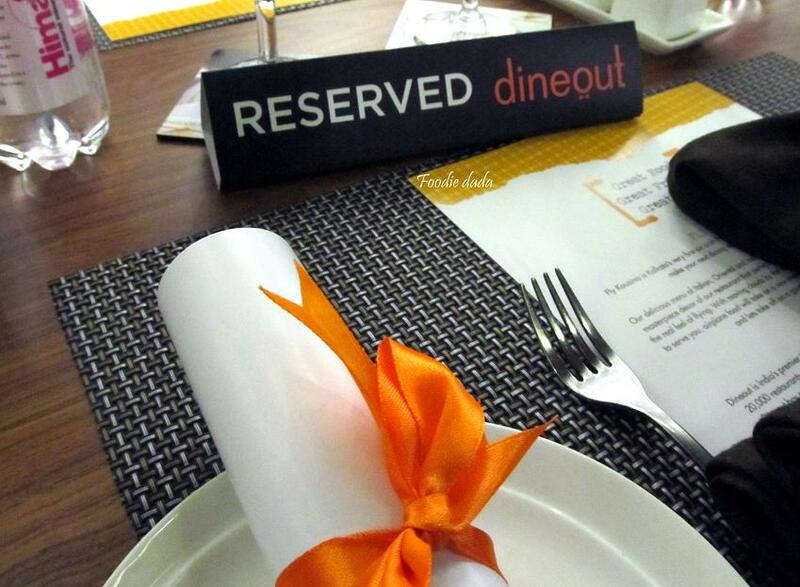 As the tagline of this Dineout Bloggers Meet goes – this was all about great food, great friends and great times! We thoroughly enjoyed every bit of this turbulence-free scrumptious meal in this unique aircraft 🙂 And we are extremely thankful to Dineout, Thinkquisitive and Fly Kouzina management for all the awesome hospitality, special thanks to Alka for being such a great host. Had a really great time with my fellow bloggers from ‘Panchphoron’ food-bloggers group. The meetup ended on a happy note and quite late into the night, maybe we took quite a long time tasting all those items 🙂 While we were all set to leave we were handed over some amazing goodies which had numerous wonderful stuffs including some gorgeous and flavorful Kaos Cookies! 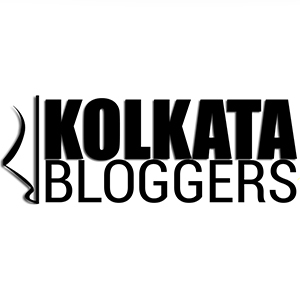 Previous Post Arsalan and its new branches across the city – Rajarhat branch reviewed!